The tag line for this flick's dated trailer reads, "when he's around, nothing quite adds up." That maybe so. For me though, The Minus Man as a September of 1999 release, "adds" up to something mighty special. It's underrated. In fact it's so underrated that hardly anyone in the free world bothered to see it (it played on about 45 screens total). I hope my enthusiastic review might stir up a small cult following. After all, any movie this good, deserves a little resurrection. Directed by the guy who scripted the futuristic Blade Runner and possessing daydreaming sequences that involve two philosophical detectives, The Minus Man follows the journey of low key serial killer Vann (with 2 n's) Siegert. Owen Wilson plays Siegert and at the time, he took this serious role in between comedic stints like The Cable Guy (1996) and his big hit Wedding Crashers (2005). I gotta admit, his performance is pretty impressive. He comes off as a relaxed, laid back psychopath. His character seems to be nonchalant, carefree, and having the equivalency of a resting heart rate in the mid 30's (just a little movie speculation). He's a drifter who according to the proceedings, lost his father, doesn't owe anyone any money, and wants to I guess, end people's lives because of their suffering (I guess he's that kind of sicko). He goes around poisoning people by persuading them to take a drink out of his silver flask full of Amaretto. It is mentioned that he may be from Oregon and is heading down the California coast. He decides to stop at a small town and rent out a room. While there, he gets a job as a postal worker all the while continuing to commit murders as he masquerades as a normal, shy person. He even befriends a married couple (The Durwins played by Brian Cox as Doug Durwin and Mercedes Ruehl as Jane Durwin) and catches the eye of a co-worker in Ferrin (played by Janeane Garofalo). Everyone seems to like him and take him in. He's easy to be around, seems to be attractive to woman, and is even able to evade any policemen who don't seem to take the time to wanna solve his killings (there is a sketch of his face in the local newspaper and it looks nothing like him). Throughout The Minus Man's 1 hour 50 minute running time, you never sense that he is in any danger of getting caught or spending his life in prison. That element, which was interpreted by myself, only added to the calm, creepy vibe that forced me to think about things long after the final credits rolled. 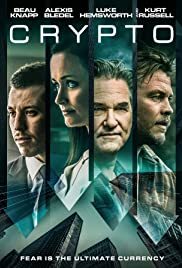 The Minus Man although categorized as your typical crime drama, is different in that it focuses more on the antagonist and hardly ever hones in on the authority figures trying to capture him. Its plot and the unmotivated actions by the main character aren't exactly clear. However, you'll still be pulled in as a viewer because of the stylishness, the somberness, and the cast of capable B-listers (Brian Cox, Janeane Garofalo, and rock star Sheryl Crow). The script is wittingly and intelligently written by director Hampton Fancher. As mentioned earlier, he co-wrote the sci-fi bender Blade Runner. If you've seen that film, you can tell that he uses his touches as a writer in that same light featured here. He's totally complex in his wording. There's a little bit of irony and you'll notice by the dialogue spoken by the actors, that nothing is what it seems. I thought it was interesting that this is the only vehicle he has ever helmed (but you wouldn't know it). He knows where to put the camera, he's good with light (I like certain scenes that are shown in a ray of bright sunshine), he lets his shots pan out, and he edits well in cuts. "Minus" was made 15 years ago. I kinda wish Hampton wasn't out of the loop and maybe someday, he could put out something new (doesn't matter what genre, I'm game). All in all, I dig this movie's title, I love its indie feel, and I think what translates on screen, is a capably numbed down thriller. Upon a second viewing, I now dub it as quietly, almost sheepishly disturbing stuff. And give credit to Wilson for being in almost every frame not to mention holding the screen in the palm of his hand (without doing a lot, just underplaying to perfection). Overall, as a rare art flick depicting a psycho killer, The Minus Man is nocturnal bliss from the reclusive 75 year old Fancher. It gets a "plus" for being a solid, late 90's cinematic tool of faux translation.